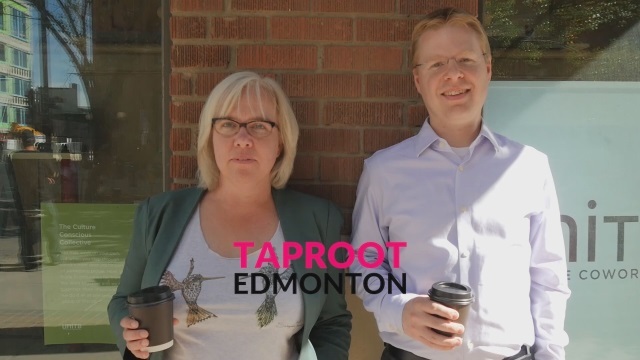 Karen and I have made a lot of progress since announcing Taproot Edmonton nearly five months ago. I’ve been including some updates in my weekly media notes and we have a regular newsletter that we use to keep everyone updated but I thought it would be useful to summarize our progress in one post. If you want to skip all of this and jump right into becoming a paying member, you can do that here. We’d love to have you! Taproot Edmonton is a source of curiosity-driven stories about our city, cultivated by the community. We are building a new way to do local journalism, and a new way to fund it. We don’t sell eyeballs, and we don’t put up paywalls. We enlist our members to tell us what they’re curious about, we commission writers to explore those questions, then we publish the story for all to see. As anyone who has tried to craft an elevator pitch knows, it’s not easy! We continue to iterate on the best way to communicate what we’re all about. Without our members, there is no Taproot. They give us the fuel we need to publish great local stories. Members share their curiosity with us and their questions are the starting point for our writers. In that way, members act as our assignment desk. They also provide us with the financial resources we need to pay writers fairly for the work they do. We are very thankful to the more than 50 members who have joined us thus far – your support is making Taproot happen! But we need our membership to grow in order to continue moving forward. A Taproot membership is $100/year or $10/month. We hope you’ll consider joining us to help build the future of local journalism in Edmonton! The Story Garden is central to how Taproot works. It’s the place that members go to post their questions, to comment and vote on other questions, and to interact with one another. In the early days we prototyped the Story Garden using online forms (we used Typeform) and we learned a lot through that process. It was a free, simple way to validate some assumptions and it allowed us to keep moving forward. In August we launched the first version of our real Story Garden. We have big ambitions for the site but it’ll take time to achieve those. Our first version is a solid platform to build upon and we’re improving it as we learn from our members. We showed off the Story Garden on September 22 at DemoCamp Edmonton 32 and received some great feedback from the crowd there too. I’m incredibly proud of both! Mel and Anna did some really great work and we have two high quality stories as a result. I hope you’ll check them both out if you haven’t already. It took quite a bit of effort to get our first stories published. We had to make our theoretical process real and there was a lot to figure out and setup along the way. Now that we have, we are working toward ramping up our production of new stories. We’re not the kind of place that you’ll find ten new stories a day, but we would like to publish more frequently than once a month. We are building Taproot because we know that the business model that used to support local journalism is broken. We want to find a new, sustainable approach that can ensure quality local journalism will exist in Edmonton and beyond. We know we’re not the only ones experimenting in this space, and that’s a great thing. We want to learn from others, collaborate when appropriate, and do our part to push the industry forward. We are thrilled to be one of the presenting companies at Launch Party 7 on Thursday evening. If you’re curious about Taproot and want to learn more, please come and talk to us about it. Next month we’re going to be attending the People-Powered Publishing Conference in Chicago. We’re excited about the opportunity to connect with others working on innovative new approaches to participatory journalism. We have a number of stories in the works and we can’t wait to share them with you! We’re working with some great local storytellers and our members have given us fantastic questions to explore. We’re also focused on improving the Story Garden and adding new value to our members. You can help us do all of this by becoming a Taproot Edmonton member today. Thank you!